It's 60 years since Levitt & Sons announced plans to build a community on Long Island to provide housing for returning WWII GIs. The New York Times has an very interesting slideshow depicting the original Cape Cod style houses and some of the remodeled and much enlarged versions you can see today. 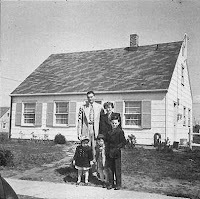 Detailed information about America's first suburban community can be found at The Levittown Historical Society.